U.S.-trained commandos freed a Kansas missionary after more than a year in captivity Friday but her American husband and a Filipino nurse were killed during a shootout with their Muslim extremist kidnappers. Four rebels from the Abu Sayaff group – believed to be linked to Osama bin Laden's al Qaeda terrorist network – were killed while Philippine troops suffered at least seven wounded in the fighting. Martin Burnham, 42, of Wichita, Kan., died from a gunshot, said Gen. Narciso Abaya, the Philippine deputy military chief of staff. Abaya said Ediborah Yap, a Filipino nurse, also was shot and died of her wounds. It was not clear whether the victims were caught in crossfire or were murdered by Abu Sayyaf. Burnham's wife, Gracia, 43, underwent surgery in the southern city of Zamboanga for a bullet wound to her thigh, said Maj. Gen. Ernesto Carolina, commander of Philippine forces in the south. Gracia Burnham was flown Friday night from Zamboanga to Manila, where the U.S. Embassy will take over arrangements to fly her to the United States. "I was so happy when I got out of the jungle," Burnham told doctors as they treated her. She said she believed her husband's death was part of God's plan. "That is God's liking. That is probably his destiny," she said. The intense fighting Friday started early in the afternoon near the town of Siraway on the main island of Mindanao where the U.S.-trained Philippine troops have been searching for the hostages for weeks. The fighting was still going on after nightfall. Pentagon officials said no American troops were involved in the operation. The Philippine troops simply stumbled upon the band of terrorists while tracking them through the jungle. It wasn't a rescue attempt, just a surprise encounter in the jungle, reports CBS News National Security Correspondent David Martin. There will be second-guessing of the Philippine army's actions, but not by Martin Burnham's father. "The real enemy is the Abu Sayyaf who are ruthless killers, and so we're not going to say one thing or another whether anybody did the right or wrong thing," said Paul Burnham in Rose Hill, Kan.
Yap and the Burnhams were the last remaining captives after the guerrillas kidnapped dozens of people over the past year. Some were beheaded and some escaped or were released. President Bush said he was assured by Philippine President Gloria Macapagal Arroyo that "justice would be done." Defense Secretary Angelo Reyes said the military could now pour reinforcements into the area and unleash its full arsenal "to finish off" the Abu Sayyaf. The group's numbers have dwindled to less than 100 from about 1,000 a year ago. Despite the deaths of two of three hostages, Reyes defended the mission, saying Philippine soldiers took "every precaution to secure the safe release of the hostages." Some 1,200 Americans are in the Philippines as part of President Bush's global fight against terrorism. The U.S. presence is the largest outside Afghanistan. Brig. Gen. Emmanuel Teodosio said the Americans — including Green Berets, pilots, military engineers and support staff — were crucial to the mission. Philippine officers credited U.S. surveillance with leading local troops to the hostages. The United States has deployed U.S. Orion P3 surveillance planes and unmanned reconnaissance aircraft as part of its non-combat support for operations against the Abu Sayyaf. "This was only made possible because of the benefits we have derived from the conduct of the exercise," he said. "The surveillance equipment of the Americans was very instrumental in locating where the Abu Sayyaf was." Arroyo offered her sympathies to the Burnham and Yap families. "This has been a long and painful trial for them, for our government, for our country," she said. "Our soldiers tried their best to hold their fire for safety," Macapagal Arroyo said. "We shall not stop until the Abu Sayyaf is finished." Philippine officers said the guerrillas evaded the troops for days but were slowed down by heavy rains Friday, allowing the soldiers to catch them. Private First Class Rene Mabilog was with about 40 Scout Rangers who first came across the guerrillas. "We were following them since last night," Mabilog told The Associated Press in a hospital where he was being treated for arm wounds. "This morning, we found their tracks and we followed them. There were about 30 of them." Mabilog said the guerrillas stopped to rest because it was raining heavily and the soldiers crept up to about 30 yards behind them. The fighting lasted about two hours, he said, and eventually included hundreds of Philippine troops. 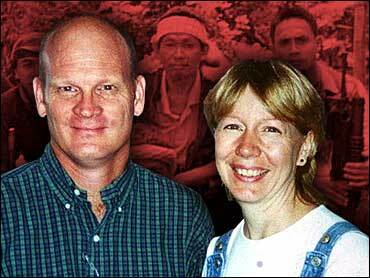 The Burnhams were kidnapped May 27, 2001. Yap was taken hostage a few days later when the Abu Sayyaf, with the Burnhams in tow, raided a hospital in the southern town of Lamitan to seize hospital staff and medicine to treat their wounded. The guerrillas kidnapped 18 other people along with the Burnhams, including 17 Filipinos and Corona, Calif., resident Guillermo Sobero. Sobero was beheaded by the guerrillas in June 2001, according to U.S. and Filipino officials. The Abu Sayyaf says it is fighting to carve a Muslim state out of the southern Philippines.